AUD: Which Commodity is it Tracking? The Australian dollar is on a tear this morning thanks to the upbeat tone of the Reserve Bank and their nonchalant comments about the floods. As a commodity currency, the Australian dollar has a very strong correlation with commodity prices. However contrary to popular beliefs, the Aussie’s correlation with gold prices have not been that strong. Instead, the commodity that it has a strong correlation with is copper, which rose to a record high today. For the past 20 years, the correlation between copper and the Aussie has exceeded 70 percent. Over the past three years, the correlation was as high as 93 percent. Although copper may not be one of Australia’s top commodity exports, it is still equivalent to more than AUD$5 billion of annual trade. 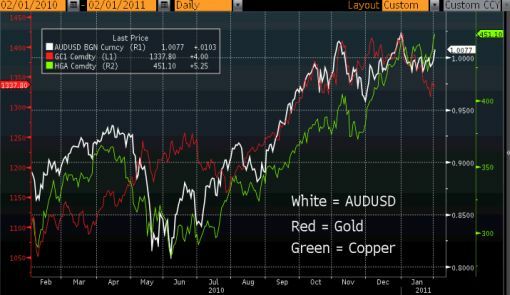 The following chart shows the correlation between the AUD/USD, Copper and Gold.